THE Papua New Guinea Government expects growth in the non-mining and agriculture sectors next year, according to the coutries Treasurer Patrick Pruaitch. 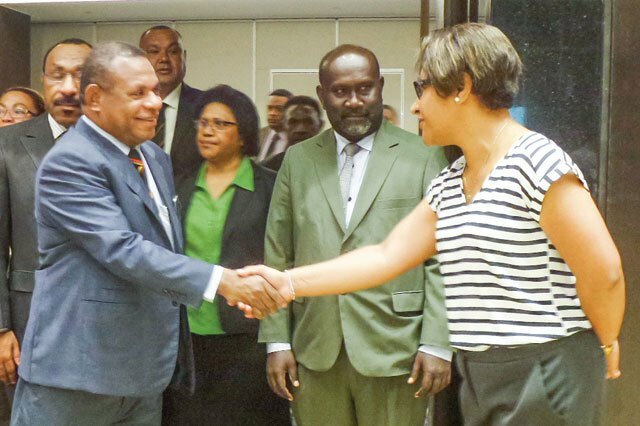 He told a breakfast in Port Moresby yesterday held to discuss the 2017 national budget with the business community that this should contribute to the forecast national growth of 2.8 per cent next year. “In 2017, our economy is expected to grow at 2.8 per cent,” he said. He said improvements in the world economy in 2017 should also help growth. “Inflation is projected to increase to about 6.6 per cent in 2017, reflecting the expectation of some effects of the kina depreciation and the slight pick-up in the domestic economy actively relating to the national elections and the construction of the Apec (Asia Pacific Economic Cooperation) facilities,” he said. Pruaitch said over the medium term, inflation was projected to ease below 6 per cent. Meanwhile, in response to risks associated with fall in commodity prices and the prevailing revenue outlook, he said the Government handed down this year’s supplementary budget to restore the budget to a prudent, responsible and sustainable fiscal path for the remainder of the year and beyond. “The 2016 supplementary budget comprises adjustments that include both expenditure saving measures of K928 million and an additional revenue measures of K958 million. The supplementary budget is focus on fiscal consolidation,” he said.